In the summer, British-grown tomatoes are at their finest. Though the first fruits will probably be enjoyed with nothing more than salt and pepper, there may be a time when you wonder what to do with the glut. If you don’t grow your own, take advantage of the season and buy tomatoes by the kilo from your local grocer – then try one of our irresistible recipes! The very best thing to do – we think – with a tomato glut is to make tomato sauce. Think like an Italian mama and make up a thick, sweet tomato puree that you can use throughout the rest of the year. Whether you grow your own or buy them in season, tomatoes are at their best in the summer. Preserve them at their best and you’ll reap the benefits when the sunshine starts to vanish! All you need to make tomato sauce is a large pan and some time – you needn’t watch it constantly but you’ll have to be around for 1-2 hours as it putters away. Skin and deseed the Tomatoes. For smooth tomato sauce, you can skin the fruits before or after cooking. There’s even a tomato passata press that does the job for you. To skin before cooking, slit the tomato skins and put into boiling water for 3 minutes. Remove and slip off the skins; scoop out seeds with a teaspoon. To remove seeds after cooking, you’ll need to press the sauce through a sieve. Chop, Taste and Season - Chop the tomatoes (with or without seeds) roughly and put straight into a large saucepan. Heighten the tomato flavour with a splash of balsamic vinegar (about 1tbsp per 500g) and a little sugar (1tsp per 500g). If your tomatoes were already very sweet or very tart, exclude the vinegar or sugar as appropriate. Simmer until Rich - Don’t skip this step – it’s vital to stew the tomatoes until they are rich and thick. 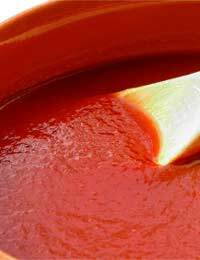 You’re looking for the consistency of commercial tomato paste – yes, that thick! To obtain it, you will need to simmer the tomatoes on a low heat for at least 45 minutes and up to 2 hours, depending on the amount you’re making. Thick puree is best for pizza bases and pasta sauce; this concentration will also take up less room in the freezer. When the tomato sauce is fully cooked, cool it and ladle into freezer bags – about 100g per bag. Your tomato sauce can be used in so many wonderful recipes. Here are just two. Make a delicious ragu to serve with penne or tagliatelle. Grill the pork sausages, slice diagonally, and set aside. In a wide pan, soften onion with the garlic. Add thawed tomato sauce, stock and red wine (a fruity Rioja is perfect). Add bay leaf and sprig of rosemary, chopped; now bring to simmering point and cook gently for 15-20 minutes, until rich and reduced. Stir in the sausages and heat through. Serve on fresh pasta. This is part of the traditional Lebanese mezze spread – serve it at room temperature with flatbreads, chicken wings, and hummus for a summer lunch. Soften onion with garlic, peeled but not chopped, in a large pan. When the onion is translucent, tip in green beans. Cook gently for another ten minutes, until the beans soften. Add tomato sauce and some salt. Cover the pan and simmer gently for 15 minutes, or until the beans are soft and the sauce is thick and rich. Remove the garlic and serve at room temperature.